SEE RICHWAY'S NEW CARTOON INSTRUCTION MANUAL HERE! The best way to start is to put your Biomat™ on a low setting when beginning. Fifteen minutes to a 1 hour session is all you want to do at first. It's best to ease into using the infrared therapy to give your body a chance to accept the detoxifying effects. Pushing all the toxins out of your body will make you feel a little sick at first and you don't want to do it all in one session. We recommend doing a half-hour session each day for three weeks. Make sure that you find a quiet place with good air circulation and we recommend throwing an all cotton sheet over the Biomat or cotton cover and after the first three weeks, up the time by thirty minutes every month. Alternate turning up the heat with staying on it longer over a period of months. If you do sleep on it, keep it on a very low setting. Athletes can benefit from a little higher setting for short bursts to soothe muscles after a workout. Professional sports teams can benefit greatly from the healing effects of a Biomat. So start slowly. Begin with the low settings (green or gold) in short 15-30 minute sessions. Allow your body to become used to the Biomat once your body has had its initial detoxification. The low gold settings create a gentle warmth great for two hours or more for sports and flexibility training, cardio and respiratory aid, blood pressure, sugar regulation. All settings are therapeutic and versatile. Establish a goal and find the setting that best fits that goal. Meditation and visualization can offer profound and cumulative benefits to the body, mind and spirit. Initially you may feel bursts of energy, or even a few extra naps are normal. Your body can be cleansing and detoxifying as your cells are releasing toxins that they've stored for years. You may feel tired and/or even a little sick at first because your body is pushing out the toxins and heavy metals, the junk, in your system. Don't be discouraged, just keep using the Biomat in short sessions, maybe extend them a little every time, and you'll eventually feel great. After using your Biomat a few weeks and slowly increasing the settings and length of time for your sessions, you could be ready to try a higher temperature for a more profound session. You might want to cover up with a few towels or heavier blankets to allow your body to take in more energy and induce healthy sweating which will draw out deeply embedded toxic wastes. The higher gold settings create deep, penetrating warmth and are great in 10 to 90 minute sessions for muscle relief, stress and anxiety relief. The red settings create more substantial benefits for maximum therapy in 30 minute to 1 hour sessions for infrared sauna-like cleansing and detoxifying, natural weight loss, better skin tone, enhanced sexual vigor, metabolism boost, increased blood circulation and purification. Many Biomat users report dramatic benefits from incorporating 30 minute power sessions 3-5 times per week on the highest red settings. This is much different than the sweating that results from heat saunas as the Biomat quantum energy may draw out six to eight inches of deeply embedded toxins. Remember to pay attention to your body - don't go any longer or higher than what make's you comfortable. The lower settings over time can create similiar results as the higher settings because the effects are cumulative. As with all healthy habits, consistency is the key. It takes a little discipline, but the long lasting effects are worth it. A 30 minute session before bed is ideal to prepare your body for the deepest, regenerative sleep. Take a warm shower when you are done. As with starting any sort of health or fitness program, you may want to consult your doctor or health care practitioner first. 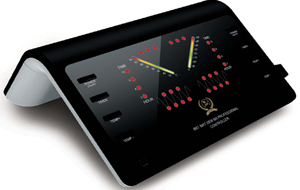 The Biomat controller has Soft Touch pad for On/Off and Temperature Control. The controller has the most advanced I.C. Chip available, which cuts off electromagnetic waves. Instructions are included for operating the controller and a controller comes with every Biomat. You can sleep all night on your Biomat™ and enjoy the cumulative effects or use it on higher settings for greatest effects. Here are what the top lights on the controller are: the left one shows you have turned on the heat of the biomat. It only comes on when you turn the heat on (by clicking the temperature up arrow button). It should stay on until you push the Power Off button under the Temperature button. The middle light should always be on, as it shows the controller is correctly blocking the EMF. The buttom on the right is the alarm light and should not come on at all unless there is a problem. If it does come on, it can mean there isn't a solid connection between the plug and the electrical outlet, so check to make sure it is plugged in all the way. If the middle light, the green light, doesn’t come on, it is usually due to the polarity of the plug being reversed. Try unplugging the controller from the wall and turn the plug over to switch the polarity.